Thank you for sharing this with us! I hope to learn a lot more from you Insha'Allah. As far as my understanding of Iqbal goes, (which is primarily based on reading his book' the reconstruction of religious thought in Islam' ), I think the method suggested by Iqbal for realizing these aspects of God's personality is through the discovery of 'self' or 'khudi'. Self does does not mean the 'human ego' or 'nafs' here, it refers to the overcoming of human ego so that that man can fully realize that there is only one true 'Ego' in this universe and that belongs to Allah Almighty. khuda banday say khud pochay, bata teri raza kia hai'. Iqbal is now getting on my nerves. I don't know how but I have to manage time to read this book. I don't know why I never thought of reading prose by Iqbal. So if God has "personality", what is that personality. My curiosity is piqued. 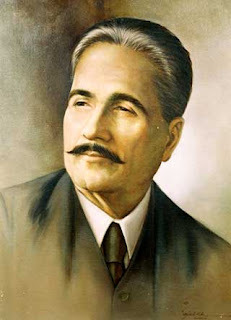 @Shazia: to some extent, your question is addressed by Iqbal at the beginning of his third lecture in the Reconstruction. But of course, the comprehensive answer is presumably to be known first hand only :). You can read the lecture at the Allama Iqbal website. jzakallh 4 sharing such a 9c in4maxn. i am relating it wd EAMAN-E MFASSIL n now value of IQBAL is acceedind in my heart. "The 'Republic of Rumi' has given a precise set of cencepts defining God in terms of Iqbal's conceptualizing of God. However, there appears to be a paradox in the concepts as given(Sufi unverse is full of them to help expand the esoteric wisdom); it is, being infinite entails being infinite in all possible directions and dimensions. "Therefore infinity alone is enough to "account" for the Almighty. all rationalization and resolves all appearences of contradiction in reality; while concepts tyrranize us with tataulogies along which logic must flow. Iqbal was nothing if he was not for transcending the universe of senses, and that of rationality which is not disciplinned by sublime transcendence. Jazakallah for sharing the wonderful information with us. when we LOVE HIM,we will WORSHIP him,in a PROPER WAY!!! The concept/journey from "khudi" (ego/I) to "khuda"(god consciousness) reminds me of buddhism. How do you derive these concepts from Quran? Quran is a simple set of obey commands and "carrot and stick" rules for obtaining eternal heaven. There is nothing else in the philosophy of Quran. Sufism seems to be a completely different religion (much more evolved philosophy) than what one can see in Quran. My sense is the content of sufism closely matches buddhism:- The prevailing religion of the conquered lands. The sufi saints just changed the symbols to islamic ones (quran and muhammed) to curry favour with the newly installed islamic rulers to invent sufism. I agree that God is Eternal, All Powerful, All Knowing, Creative and Infinite. I am curious to learn what Iqbal has to say about God's personality. I agree God is Eternal, All Powerful, All Knowing, Creative and Infinite. I am eager to learn about Iqbal's concept of God's personality. Thank you for this post. These are intriguing concepts. I am interested in *knowing* how these may come alive, through humans, as Marghdeen.